Movies are amazing on a massive screen in HD and surround sound. But, you didn’t buy a projector for just movies; you want to be able to watch live sports, shows, and mind-blowing nature documentaries with the same experience. 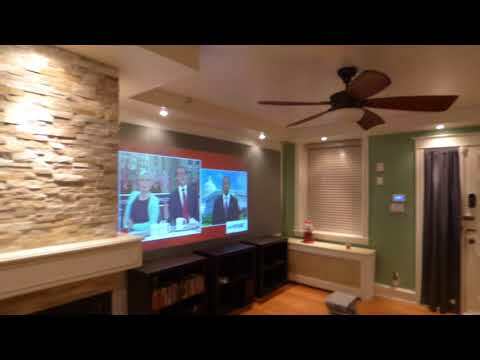 You may have asked yourself how to watch TV on a projector without a cable box. Well, thanks to the internet and a myriad of available devices, you can have your projector and your favorite television series too. We will show you a group of solutions using technology and streaming services that will break you free from the box. Before we throw you into the fray, we need to cover a few things that are absolute necessities to be able to watch TV without a box. If you can’t do HDMI, at least make sure you have a DVI port. HDMI and DVI are the purest digital signals that will provide you with the clearest picture, regardless of what you use to view your content. If you don’t want a cable box floating around your house, a high-speed internet connecting is essential. 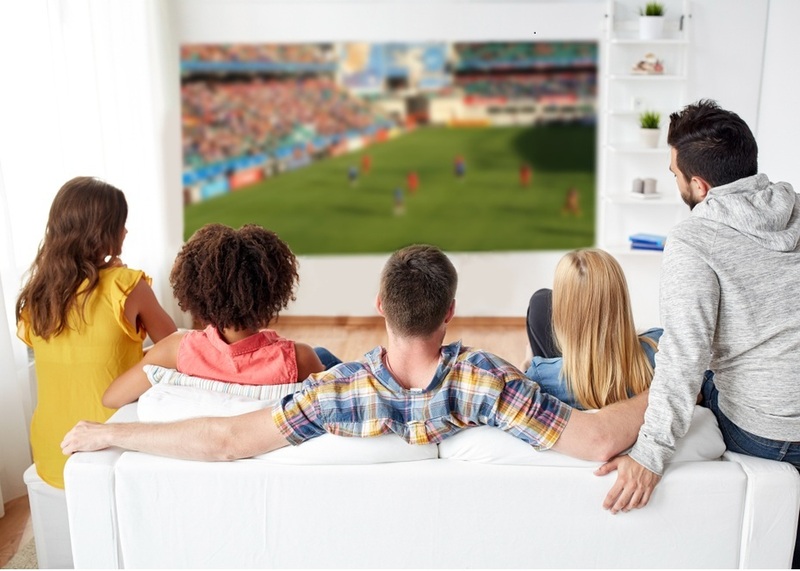 You may be able to get a few channels with an antenna but, to get all the content you get from a cable provider; you will be using some form of streaming service. When choosing your internet speed, we recommend 25 megabytes (MB) or higher. Live TV streams much better with a faster internet connection. Speeds over 50 MB are worth paying more to eliminate low-quality streaming, and constant buffering. You can either hook up your devices to the internet with an ethernet cable or through a Wi-Fi enabled router. In general, a wired connection is a better option because it is more stable and higher transmission rates than Wi-Fi. However, that also means you will need to longer wires to connect wired devices. Wi-Fi is a cleaner option that won’t require you to mount devices on your ceiling. Plus, you won’t need to acquire extra-long cabling to connect your player to your projector. When using a Wi-Fi router, make sure it has the least inhibited line of sight possible to your projector to limit connection problems. The number of gadgets that allow content streaming is almost limitless. However, just because you can stream doesn’t mean it will work for your home theater. The best devices will plug directly into the projector with limited needs for adapters. Here are our favorite direct connect options. The Google Chromecast is a small device that lets you broadcast content from your phone or tablet to your projector. The Chromecast turns your phone into a live remote that allows you to browse and select content before it reaches the screen. You need an HDMI enabled projector for the Chromecast. The Fire stick is another direct plug-in device that is small and easy to use. Plug into your HDMI port and access an enormous library of streaming apps that will put TV at your fingertips. 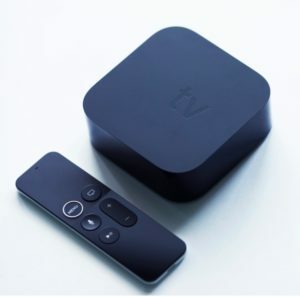 The Apple TV is bigger than the other options and will require a platform to support the device. However, it is still small enough that it won’t cause mounting problems. You have access to Apple’s app store that is sure to have the service you want to stream live TV. Like the other options, the Apple TV connects via HDMI. Using your PC as a streaming device is the most versatile option. Many live streaming services have a website associated with the service, and some streaming companies don’t have available apps on all devices. The downside of using your PC is that you will likely need a longer connecting cable. The upside is that you have more connection options than with the other streaming devices. Hulu has built a solid foundation for providing the best TV shows the day after they air on live TV. Recently they have launched a live streaming service that takes away the wait time, plus enables you to view live sports. YouTube TV is the new live service provided by this long-time video company. Using the platform, you are already familiar with you can switch between the latest news and sports to that video your brother emailed you that he promises will make you die from laughter. Not to be outdone by the internet, your cable or satellite provider likely has an option that lets you stream channels using an app or their website. You can use your PC, tablet, or the above devices to watch live TV channels. You may still have a cable box somewhere in the home, but at least you don’t have to hook it into your projector. With all the knowledge we have thrown you today, you are ready to start watching all the best cable content on your projector without having to dedicate yourself to the box. Go forth and enjoy your new content bounty.